Have your completed your Account Set-up yet? If not, you should definitely take a minute to do so. In this quick video I walk you through the steps of setting up your Wealthy Affiliate account, how to add a description and image, and the benefits of doing so. Having an account properly set up here (with image and profile description), will lead to much better communication within the community and can actually lead to 5x more support and followers here within the community. If you have any issues with setting up your account, please do let me know and I will be more than happy to help you out. Hi, I added a second image for my profile but just wanted to know if there's a way to just switch back and forth between images without having to crop each time? I already cropped both the way I like, but I notice the only way to switch is to crop first even when the second photo is already uploaded. It's the same for mine. I think this is just the way it is set, every time I click on one of my own photos to view, it always shows the whole image but giving me the option to crop it. When I view other members profiles, the photo shows as small circle thumbnails. And when I click on the photo, it opens up to show me the full image (of course I cannot crop other peoples photos -- only my own). Is this what you were asking DetailsD? Hello to everyone here specially to Carson and Kyle. Thank you for giving me some of your time to welcoming me and showing to me what is WA is. I hope that I can learn here my very first traing about website and how to use it. I have to tell you this that I am not sure what to do in this media. All I know in the internet is my children show me. I do facebook and messeger and email and a little research that when I come to know your WA through the review. In short I dont really know how big and how to really use internet. I am a simple mother of 4 all adult now. And My source of income is cooking and selling food that I cooked. Its hard to met ends in my part. My goal in life is to have a decent home and earning not just for myself but to help all my family specially my parents. And now I am only holding on to my hope that someday I will find my dreambof good lufe. That is fine Josephine! I was once "green" to all of this Internet stuff, as with anything new you are going to be green to it when starting out. No different than riding a bike or learning how to talk, you once didn't have this knowledge but you acquired it by doing and by being taught by others that know how to do it. Welcome, Josephine. I think you will find the training and the community to be of great benefit to you. We all started in the same place and Kyle does an excellent job of walking you through each and every step in the training program. We also have tons of experienced members all willing to help. If you have any questions or need anything, please don't hesitate to ask. I have been here at Wealthy Affiliate for over 3 years and I am constantly amazed by the vast body of knowledge that is Wealthy Affiliate University. I have updated my profile description and will soon update my photo. Thank you, Kyle and Carson, on the, (still searching for the proper adjective), program that you have built and continue to offer at such great value. There, ... I've found my adjective. VALUABLE! Awesome, love your adjective too! Just wait until you see what we have planned for the WA platform and community in 2019. Exciting times ahead! I am very excited to get started ,however ,having been through a mine field off scammers was just clicking away trying to get going .Long story short, due to prior engagements where I will be off the grid for the next 4 days, a.k.a. hunting, won't make the 7 day dead line. I am not a person to burn bridges, so what do you recommend? I would say, upgrade to premium because that will give you an additional 30 days at the price of $19. If even after those 30 days, you feel that WA is not for you, you can always cancel with no penalty and no strings attached. Those 30 days will also give you the FULL experience of what WA is about, unlike the Free membership which is limited. Having EVERYTHING at WA at your disposal is the best way to give yourself a chance at this. I can understand because I come from a background having fallen for a lot of scams. I have to honestly say that WA is the real deal! I just hit my 3-figure month in november. You won't have anything to lose by giving yourself an additional 30 days with the $19. That's my honest advice, but the rest is up to you. Well, I 'm new to WA, I have a desire to operate an online children clothes business. I have been busy on the internet searching for solution to my problem, I came across WA and decided to register. Not sure what this is all about as I am a confused person already. Hope to get some awesome advise from all these beautiful people in this community. I am new, as well. if you want to compare notes, please let me know. Not sure what you mean by dual monitors. Are both monitors being run by the same computer or do you have 2 computers running. One computer tower, but two monitors. Once you set it up your mouse will float between the two as if you have one giant monitor. I have found it indispensable for my productivity; so much so that I've even considered going to three across. The only caveat is that you generally will need multiple video cards, but that's an easy fix. I'm new here, so I'm not sure yet on the "rules" for posting, so I didn't want to include a direct link just in case. But if you go to YouTube there are a ton of videos that will walk you through the whole process. I used to run a bank of 3 monitors, but I found I was getting too distracted so I moved back to one. It was pretty awesome though, I had that set-up for many years. Is the first video about a tour around the platform and the second for account set-up? Is it the same video and maybe it needs to be changed? This training video is regarding "Completing Your Account Set-up at WA - Adding a Description & Image"... meaning your profile page... and is only 11:03 minutes in length. There is no second video here. Wow, sounds like your typical run of the mill scam. Qualify you for as much money as they can take from you. We work differently here at WA, we let you have a free ride, then decide if you want to go Premium (our only paid aspect). Completely up to you though! I can appreciate that Peggy, most companies out there are in the business of making money at any cost unfortunately (in particular in this space). Not a day goes by where I am not working with someone that is jaded by the entire industry because of past experiences. I can tell you that we different, we care, and we truly have you and your long term success in our best interest. Instead of me telling you though, I would rather prove it and let the community and everything within the platform speak for itself. I have had the same experience. I have followed someone and gotten some tidbits here and there and not anything really helpful. The don't overthink your description was very helpful. Also, since it is editable, you DO have a chance later on to make it perfect over time. Besides, as you grow and your business grows I have no doubt the description that is accurate will grow, too. Iv tried to add a profile picture of myself from my computer, when I add the picture it comes back to the page were your have the three choices, says 100% loaded but my picture doesn't load, I can't seem to add a picture of my self, I can only choose the ones available, ie the mountain picture iv chosen, I'm doing it on my Samsung galaxy touch screen, would that be why? It's a pad not a computer as such, I used to have a lap top but not any more, I could get access to one then try it on there, thank you for your help and nice to meet you! Yeah, that actually happens quite a bit because of the header that gives you particular steps to set up your profile. I do have a good set-up, but some of the videos are using a different filter (on another computer that I used to have). I have my newer one honed in much better, so you won't notice the pfh as much in those. Hi Kyle, Im doing some back tracking as I feel I need an update on the basics I have noticed that my page is missing the short cut buttons at the top of the page, is it possible for an update I enjoyed running through it again, picked up quite a bit that I had forgotten or you have updated the learning skills. Just don't try to do everything at once. If you try to swallow this in one big gulp, then it will be overwhelming. Appreciate the fact that you are learning something new, and that can take time. This industry was new to everyone at one point, myself included. Back when I started I had no knowledge of the Internet business and this. As you move forward, you will get the hang of this and things that you are overwhelmed with by now, will become second nature. You can learn this and I can assure that everything you need is here at WA to create any level of success you want! I really do look forward to seeing you progress as you move forward Jamie! Let me know if you need a hand if you ever feel even a bit stuck. I have been around on the net for a few years now getting burnt left right and centre trying to find a way to build a strong busines on the net. Some were down right rubish and were trashed and some were not accessable to me at the time and were parked. Wealthy Affiliate is very appealing and resembles what I am looking for. I am looking and hoping that I have found the gem that I crave for. You have found the gem you crave, I can assure you of that. But instead of me doing this, I would rather you immerse yourself here and find out for yourself (and come up with your own conclusion). Thanks for your very warm welcome message. I have seen all the videos and have read all the information in the course up to now and am now in the process of filling the wholes I left behind. I would like to know what might there be for a multilingual site, if anything. I am basically interested in implementing English and Spanish languages to direct US and Latin markets, both within and outside the country, mainly Mexico. Thanks for the opportunity you are offering. The amount of work put into this project is more than obvious. Good to meet you! I would suggest you create your website focusing on just ONE language. When you try to translate your content (translators do a horrible job of this as they are far too literal), you take away from the overall site quality. When you create an "additional" website, you create double the work for yourself without knowing if the campaign is going to be successful or not. Both of these will lead to much more work and a lot less focus. Focus on one language or the other when starting out Ioannis, once you are successful with one you could diversify down the road and build out a second website and create a translated version of your website for an additional revenue stream. Great platform going on here, a different world of people wanting the same thing. I was always skeptical about these sorts of things but once i done abit of research i believe this could be the start of sometbing BIG for me. All the best wishes to everybody on here, especially the new ones like me lol. It is only natural to be a little bit skeptical, but now that you have found Wealthy Affiliate you are definitely going to be part of a community that cares, as well as the most comprehensive/advanced platform in the space for building a business online. Hi Kayle, don't know what i m doing and where it will lead to me since it is very new thing for me, but my passion towards internet and to explore i just want to give a try from grass root to absolutely switch my career on it. I will definitely follow u thoroughly till entire end of the course. Hopefully this is the switch that i was searching for the long time :), excited !! nervous !! enthusiastic !! Have through the training to take action on that, it will walk you through the process and get you taking action (which will lead you to building a business). By lesson 4 alone, you are going to have your very own niche website up and running which is the foundation for your business! I am relatively new here too but want you to know this is clearly a very well developed program where you get all the help you need to find your way. Please do drop me a note if I can lend a hand to you as you go. Question: I'm new and am trying to set up my account. I want to put in a photo from the photo gallery , to create my profile. Iam not on Facebook, and intending to join it. Could someone tell me how to paste or transfer a photo from my photo gallery on to my profile page. Had great success with things learnt from WA a few years ago. Personal reasons meant my business was put on hold. Now I'm back for a refresher and to take things further than last time. I used the knowledge from this community to grow my own business site rather than being an affiliate to a 3rd party, but it worked just the same. It is so wonderful to have you back here at wealthy affiliate Michael! I am sure a lot has changed, as we continued to evolve with each day that passes and we have some really big updates coming in 2018 (with probably our biggest improvements every coming next month). I almost forgot that I am starting something that will make me a lot of money...and it's not on Facebook. Hahah. Thanks guys! There's no need to be nervous at all, you are going to get the hang of things as you move through the training. We all started out as complete newbies within the online world (or anything for that matter), and you have access to the most comprehensive, advanced, supportive, and cost efficient platform in the world for creating and growing a business online. Hi Everyone, it has been a difficult six years for me lots of ups and downs but hey! am still here.My goal in life is to make six figures a month promoting CPA offers.Am really passionate about this. I am a newbie and would appreciate if anyone has experience in CPA offers to get in touch, please.i just want to Focus on CPA offers for now. Thanks, Guys! Well there are lots of CPA offers out there, but the initial focus is going to be the foundation and the framework for your business. I've seen numerous online money making schemes over the years. I have yet to find one that does what it claims. Up sales are the worst. So far I haven't seen that with WA. We'll see how it goes as I go through the training. Can people really make a full time income by using this platform? Yes, some of our older WA members blog for a fulltime income. If you search for success stories on the site you'll find some really interesting personal accounts, some from people you might really identify with. Have a dig into the member's posts and see what you find. Some of these people have been at it for up to ten years. So, it's evidently been worth their while! I'm new here Barry, so I'm probably not who you expect to hear from, but I do have to say that I have been searching online for a long time also, and this is the first site that the focus hasn't been toward the upsell. There is the Premium account, and yes I upgraded after a week and a half of being here (now just about 2 weeks), but have found a completely different atmosphere here. The focus has been on building your knowledge base and online business presence, whether or not you continue with WA, or with the free account or premium. I found that refreshing. The community is way different here also, based on my past experiences, as they are very supportive and engaging with help, advice, support, and encouragement, again whether or not you've joined premium or are using the free account. Believe me, I am not trying to sell you either, I'm just relating my experience here. I have every confidence that you'll discover this for yourself. Much success and I look forward to seeing you around the WA community if it works out for you! Thanks Bob. I appreciate your comments. Best of luck. No worries! Have fun here. Hey Barry, yes, it is absolutely possible. I make a full-time income with affiliate marketing, and I learned how to do so by following the training within WA. I will say that it takes time though. For me, it took 3 months to make my first $1.17 from Amazon and it wasn't until the 6 month mark I was earning regular commissions. So if you can really commit and take massive action, you can absolutely make a full-time income. It's just time and effort really. We have MANY members create REAL businesses (ie full time income) here at WA, within pretty m much every niche you can imagine. We don't SELL based on the idea of success as that is a poor way to sell a service that is actually a tangible service like WA. We sell you on what we are, the most advanced and comprehensive, supportive and cost efficient platform in the the industry for creating, growing and managing your business online. I know you are going to love your experience here Barry and if you ever have any further questions just let us know! Thank you for that info. That really helps relieve some anxiety. Thank tom for your info you shared. I'm just wondering if I dig in and give 10+ hours a day for a few weeks if I will be earning. I haven't upgraded yet I'm on lessons 4 . I just don't want to be wasting time? And more importantly money. It is possible to earn some money in that time with such a solid commitment, but thinking in terms of 'weeks' in this business is never a good thing. You really want to think longterm, because that's what WA is showing you here. How to set yourself up for longterm success. I understand what it's like when you're just getting started. You want to make sure it's real before committing longterm. I get it. But the reality is, how quickly you earn is an impossible question to answer. Because there are so many variables at play. I know that in the longterm it will never be a waste of anyone's time if they see it all the way through. I know this first hand. Which is why I recommend taking the longterm approach if and when possible. To put things in perspective, I like to think of it as if you're doing your degree in affiliate marketing. Except at the end of just one short year, you are very likely going to be earning a nice passive income, the following year you could easily reach a full-time income. As oppose to doing a typical degree for 3+ years, being stuck with debt, and hoping to maybe land a job at the end of it. I'd love to say you could start making money quickly, but I'd be full of it if I did. All I can say is that if you take massive action on a consistent basis, you can and will reach your goals. You likely will not be earning in a few weeks, if you are looking for a program like that they do not exist. 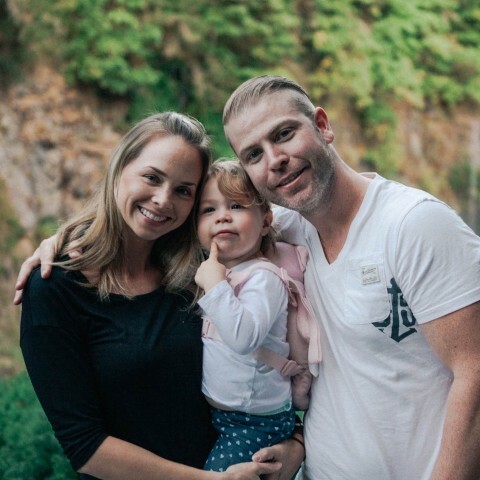 We teach you how to properly build a business online here at WA, which takes some time (but is much quicker than a conventional offline business). From my experience, your website and your business will start to see some breakthroughs around month 3. That is what happen for me, and here I am 16 years later (of being full time online). I to am very leery of work online, but I would like to see if I am intelligent enough to follow the process. So far which isn't very far, I am kind of having fun with it, very interesting, and I interested in learning something new, and my niche should be in just that but maybe later I am thinking of Beauty and or Fashion. You are going to do great Debi. Things like building a website that took 30 days when I started out (back in 2002) now take 30 seconds. Technology has advanced, the process has been simplified, and what you have access to here within WA is unmatched within the industry. You are in the right place and what that "other" company was offering for $1,000s will pale in comparison to what you get with the premium membership here. I look forward to working with you Tom! Thanks so much Kyle. No questions yet, but am sure I will have plenty as I progress through the Trainings. Your video was great on setting up our accounts and providing a profile explanation. Looking forward to building a successful online Affiliate business! All the best and great success to ALL WA Affiliates! you have video abouth this problem,how to do this. Download the image to your computer, then upload it here. If you have the image within an email, you should be able to right click and save as. Then you can upload it within your profile here. I am a start up. I was wondering can I still earn commission as a start up and apply that to the upgrade? I'm in a money crunch right now and was wondering if that's something available to us newbee's. I just lost my job on 12/4/2017 and it's been real tough. My last paycheck went to bills and christmas. So we are really strapped. As a starter member, you earn 25% commission on any one you refer to WA. Also, you can put affiliate links on your free site from any affiliate program related to your niche. What type of things do people normally list/ add to the "Accomplishments" section? It was shown at the end of the video but not really explained? So my REAL question is, are these "Accomplishments" based on what you have accomplished HERE on WA...? Or are they more generalized to your "Niche" and or your life experiences OUTSIDE of WA...? If you are referring to the video the circles or little icons under "My accomplishments are badges that you will receive from making accomplishments from completing task at WA. The wording above the "My accomplishments is your WA blog, you can write about your WA accomplishments/success and journey here at WA, I have seen people write about different topics, like teaching the community on how to do certain things whether it be from their niche or personal experiences. Thank You!! If you didnt explain that to me, I never would have known!...lol! I did a short reflection of my life with examples using words that reveal my personality. It creates an image along side the photo. Hi, I am a little slow to catch on to some of this I thought I had to upgrade before I could comment. I went on to next step and decided I needed to come back here and write something. The Notice below made this a little confusing for me, bul here I am now. Bug us all you want Stephon! You have lots of hear every step of the way and I really do look forward to working with you. I know you're going to love the training in the overall process, we teach what works here! Hi Stephon, welcome to WA, glad to have you here. Well I finally got a photo that I liked, hope you like it. Any constructive criticism would be appreciated. I also posted my description for the third edition. I finally got down my bio to an acceptable description of me as a person. I am really excited about meeting each of you and I hope you like my bio and pic. I think you have done a good job setting up your profile, and you're ready to move forward to the next . Welcome to the community Jason, and congrats on going premium! I really look forward to working with you. Very good video! I love how it was put together, so clear and everything explained very well. Wanted to make one point about the uploading of a picture part of setting up my account, though. I was so pleased to see that I could rotate my picture when I hit browse!! I think it's just a Windows 10 glitch, maybe. But I've always had pictures come in at weird angles on other sites when uploading. So very awesome that it was just that easy cause I could rotate it! Very clear and easy to follow thanks. I did go ahead and complete the "goals" as well. However, after I hit save I noticed I repeated some info. I want to go back in and clean it up, but not sure how to get back into that section to revise it? I went into the Edit Profile and can update the description but don't see where to update the "Goal". Please let me know. Thanks! Here is the money goals thread: What are your "money" goals? You can find and edit your goals there. Great to have you here at Wealthy Affiliate Maribel! So refreshing to here a professional, well spoken voice. Thank you! The video was too the point and focused. I have been part of numerous online videos and webinars that are exhausting to listen too. There are too many people out there claiming they know how to get started. I know this was only related to account set up, but it was a great first impression and I look forward to continuing the training. We teach what works and you are going to learn how to PROPERLY build a business online at WA. There is a reason we have been around for 12 years. What you get here is by far the most comprehensive, cost efficient platform in the industry. Lots of support every step of the way, so if you ever need a hand with anything at all let us know! Now that I've went thru the account setup process a couple of times I see that it IS really a simple process. Being familiar with an area or application does make all the difference. I suggest to any one just starting out to go over the walk thru at least 2 and then...Jump In! Success and Great Fortune to One and All. Absolutely, and as you move forward through the training you are going to gain some really advanced knowledge in a short period of time. We teach what works now, and will work for many years to come. Off to the next step here and I see you are all set up and ready to go! Hello all! I'm new here and new to affiliate marketing as well. I've come across WA over the years in my search for online businesses, etc. I've seen alot of bloggers post about it when they are giving their reviews on other online opportunities and they always seem to talk about how this is the most legitimate opportunity they have found. I was honestly confused on the whole concept of affiliate marketing and I still am a bit on how exactly this works with WA. Do we create a website where we are selling our own products, then post links to our products in different places? I'm sure once I go through all the training, I will have a more clear understanding of it all. I have always pushed this opportunity aside because I didn't understand it, but I am here now and READY to learn! Thank you! I really appreciate the info! I'm glad to be here and right back at ya Kyle! I am new to this marvelous business, comparing with others, is the best, I am so happy I make the decision to learn a lot in this great opportunity. I wouldn't like to be rush to be premium, without find out if the business work for me. So, please, easy, cause I have to learn in order to invest. Hi Stellian, it took me over two month to become a premium member after I started free member of WA. I was not sure just like you. But I actually regret I waited for that long. Once I became a premium, now I actually learn from the community, and what other people are doing as affiliate marketer. When you are free member, information is so limited. I wished I knew about this community many many years ago..! Thank you Kyle and Carson for creating WA. Big step, I just added my photo and description. I'm not sure how I feel about the count down for the premium membership discount. On one hand I hate pressure induced sales on the other hand I know it will ensure I work hard for the next six days so I don't miss out on the deal. Totally disregard and ignore that. You can sign up the premium at any point and I recommend that you acquaint yourself with the community here. Learn how to build a business the proper way, which is going to be covered in the first level of training alone. Buy lesson 4 alone you are going to have your very own website up and running! Thanks Kyle: I'm one of those people who have to research everything to death and think about it for awhile. After sleeping on it and considering the pros and cons I signed up for premium this morning. Thanks again for the great support and community. I am on the free offer, but plan to upgrade in a day or two. I have been looking for an on line business and education program which has the type of support needed for someone like myself who is not savvy about banners, links, clicks, creating traffic and all that goes with this. Well you have definitely found a "home" here in Wealthy Affiliate Marilyn. Absolutely everything you need is here, including support and mentorship every step of the way. If you ever need a hand, just ask. We are a community of caring folks here at WA! Account set-up is very easy...thank you. 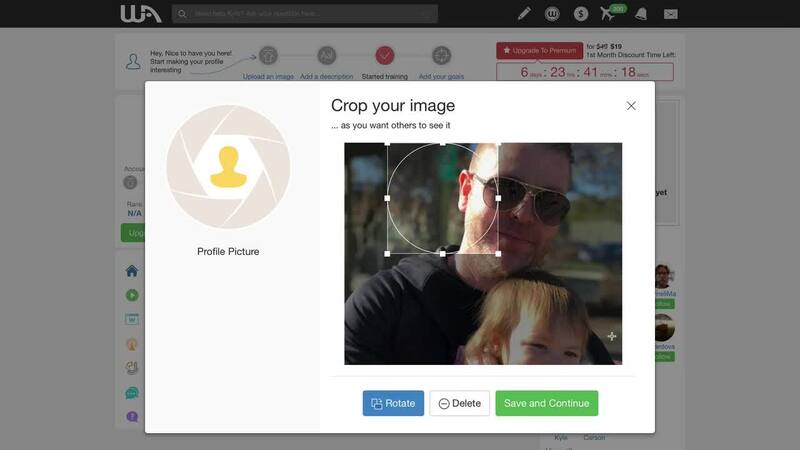 I appreciate the demo on how to edit my profile and change my image. I also like that you allow images for those of us who are not ready to go public, while at the same time advising that the face is more personal and will add to building success within the community. Yeah, for sure. Do what you are comfortable with, you can always include your own image down the road. Completely up to you though. Great to have you here as part of the community! I started a national and global consulting business a few years ago and have a professionally done website. I naively thought the future of the consulting business was in clients seeking experts to work remotely in other states and countries. Advertising, LinkedIn, various on-line networking groups, Twitter, Facebook, etc. have mostly been of minimal benefit, particularly since the ZG Worldwide Consultants brand is largely unknown. We have had some interest from matching member client with member service provider through the Global Chamber of Commerce (I'm a member but not an employee), which is more proactive in this regard than most chambers of commerce. McKinsey & Company and Accenture likely benefit from advertising and social media since they are well recognized. With all the scams going around people don't trust what they find on the internet. Referrals and testimonials can be meaningless hype. While e-commerce in selling products has been highly successful, the best thing for getting potential clients interested in us has been traditional humanoid to humanoid in-person interaction. I'm trying to figure out how Wealthy Affiliate can help in my line of business. Excellent Lothar, that will make for a good description on your profile. What is the focus of your consulting business? I'm new to the community! I'm trying to figure out what purpose it serves to have multiple followers within the wealthy affiliate community? Does it directly affect your ability to generate income through affiliate marketing on your own personal website or is it more geared towards having a tight-knit community to help you create the best possible website, and in turn, yield you a better return? I want to understand why it's recommended to create a more in-depth profile, with an about me description/profile picture, instead of focusing on creating custom content for your own niche website. The 'profile' doesn't have to be 'in depth' it is just a brief introduction so when you ask questions and interact the other members in here simply see who we are talking to, you will also see that people get to know each other a little, it is not impersonal, friendships can be formed in here. Also, for the bootcamp affiliate program a referral does need to sign up fully for someone to get commission on that. You will get two different answers on the 'follow' aspect though, some will say it is important, I will say it is not. And you are 100% correct in that it will not help your income or website. If you read my blogs you will see I speak out about people getting caught up in all that and gaming the system for 'rank', but that is not why the system was set up and the whole rank thing will change just the way google keeps getting more selective in its algorithms. The platform is not set up for a 'tight community' in my opinion, we are a mixed bunch, as someone said it is a business community with a social aspect [and some people get that the other way around in here] but it is a friendly place where people help more than you might expect. The system trains newbies to advanced superaffiliates and you are going to see quite a mix of activity in here, because people have a lot of freedom, but you can just focus on the training and pop in and out to ask questions and interact when and if you like - which is always what I encourage people to do. You will notice some members produce extra training, when you get to know who is who you might then want to follow them, for example members who produce good training or advice eg Nathaniell and many many others. I'm kind of wondering the same thing, but I think that much like FB, if you take the time to flesh out a proper network you'll find like minds and perhaps new business partners. Many horses pulling the same cart can get the cart up the hill faster. You can follow whoever you like, follow people that help you, follow you or that interest you. It is up to you, those that you do follow you will be notified when they publish blog posts/questions here at WA. It is your way of networking with others and building your circle of friendships here within WA. The greater the network you have, the quicker the help as well as they will be notified when you post questions, blogs, etc. Hope this clarifies for both of you! Hi - I just signed up. I actually have a website already - one is live and I have another in the redesign stage. Unfortunately I am on vacation at the moment with my children and grandchildren so you may not be hearing much more from me for another week or so - should have thought of that when I signed up! Looks like I am going to miss my window of opportunity to ask questions! And god knows I have plenty of them!! Sure, no problem at all Marcella! Enjoy your vacation and when you get back, dig into the training here at WA. And of course if you have any questions in the meantime, please do let us know and we will be happy to help you out. I know you are going to love the supportive and forward thinking community and platform here at WA! I had actually set up the image and had written the description today the guide of training video. I saw the "4 Simple Steps!" notation at the top of the screen so I just did all 4 steps, if i want to change anything after watching the videos I guess I'll do it again. Awesome, you are working ahead already. I can tell you are going to fit right in here and you are going to see your business evolve very quickly as you move forward through the training. I had actually set up the image and had written the description yesterday without the training video. I saw the "4 Simple Steps!" notation at the top of the screen so I just did all 4 steps. Oh well, if i want to change anything after watching the videos I guess I'll do it again. Hi! You should be able to just hit upload and pull a file from somewhere (desktop, downloads, documents...wherever you have a pic) on your computer. One sentence is completely fine, add whatever you like to your description and you can always update this information down the road Tanya. I listened to the video about selecting pictures. I really wanted to keep my yellow smiley face as the front picture, but after hearing the video, I decided it might not put out the professionalism I desired. But it's one of my logos. You guys been on here a long time. What should I do? I don't want to be professional all the time. I wanna be lighthearted once and a while. I'm a newbie. Yes I agree have some fun. You have a blog if you wish to blog to have fun with. The image represents that you can be a professional. Your verbal and textural communication will reveal your true character and it should be flexible to match the present situation you are in. You are right... sometimes too professional attitude might viewed as a lawyer like, cunning and deceptive? (not all) Yes, people will relate to the character you portray. In live situations, find out if you can about the person you're about to meet family, hobbies., kids sports etc... and make small talk about that to break the ice. If you visit someone in their home or office.. look at the pictures on the desk and walls. cetrificates..etc...to start small talk to break the ice. Setting up your account is very easy and I enjoyed it. I can see from other profiles that people over time have developed and expanded upon their interests while I kept mine simple for now. I'm thinking as I learn more I can indulge more of what I want to make my business. If still have no idea as to what my niche is but I believe with good company and plenty to learn here this is a great place start. Did you check the task completed box? Continue working through the training and taking action on it. You don't have to upgrade at this point, you can do so at any point you like. Within the first 10 lessons you are going to have the foundational building blocks of your website all set up and ready to go, from there you will be off and running for a much longer and more successful journey online. Upgrade at your own pace and what makes the most sense to you! Thanks Kyle. What I am wondering is when I create my webpage before I go premium, what domain do I use? and then when I upgrade can I then pick a domain? or how does that work. The first month is 19.00, it took me 2 months of looking at other possibilities and now I am thinking, I will worry about it later. The cost is low considering the other programs I looked into. Some were 100's right away, while others were thousands with the option of monthly payments. Don't believe me, look into it yourself. BTW, I am doing contracting customer service that only pays when someone takes action. I have been working with no earnings. Lets pray for each other. I thank you kyle for the warm welcome and being received into this community organisation. I felt very fortunate for having found something I think I can work with and learn from. And it is also good to know that I am not the only one in this boat. There seems to be a lot of us looking for the kind of help that we should be able to find here. No problem at all Joseph, wonderful to have you here and I really do look forward to working with you. We were all NEW at one point in our journey and that is something that we have never lost sight of here at WA. Well you are definitely in the right place David and I know you are going to love your journey moving forward. You are by no means late to the party, there has never been more opportunity online than there is today! Is this the right platform to service the Inbound marketing needs of our Business chamber members? Out of the 520 member companies +- 230 of them hosts their web sites with us. We grow by +- 5 members per month and we want to introduce them to Internet marketing. I see that you only allow 50 sites per affiliate, how do we increase that? 50 sites is more than enough for anyone to run many multi-million dollar online companies. If you need more than that per account, then cross that bridge when you get there. What you are saying is that WA is only for hosting commercial sites and that we cant analyze / monitor ordinary sites for the purpose of content / internet / inbound marketing? Please visit our site Chamberlink in south Africa co za go to members and see the sites we are working with. I need to be sure before I commit our chamber to anything long term. You could host any type of site that you like here, that is up to you. We do specialize in Wordpress sites though and if you are building out Wordpress sites (for any purpose) there is no better place. Please answer the question and I will join immediately. We want to move away from HubSpot and analyze our 230 websites which we host at Hetzner, in WA. All our sites has been developed in WP. We cant spend the Chambers money without authorization and I need to convince the board to do so. It seems I do not understand "drag and drop". Thought it was similar to copy and paste. I have an image on my desktop I want to use in my profile. I right click on it and have the copy option. Clicking the "upload an image" as step 1 (top of this page) I get the spot to "drag and drop" an image but right clicking there does not give me a "paste" option. I am missing something in the process. How do I get the picture on my desktop to the drag and drop spot so it becomes the profile image? Instead of dragging and dropping you're probably better off with just using browse. Click on the browse option and it'll take u to where u can just click on the picture u want to use and you're done. Got the image thing figured out. Would like to change my RLG which was done the day I started the free membership thing some time ago. Would like to put something else in there. How do I do that? Thanks. I forgot about the holding thing. I did figure out the browse part which is why there is now an image. I would like to change the RLG identifier, which is what I used when I first joined some time ago and put something else there. How do I do that? At first I was like "what in the world is an RLG identifier?" haha then I saw your username. Kyle I have watched this video over a dozen times, The tools you used in this video are not found in any of my websites.I am eager to add my face to my profile as I know it is important. I even try to drag and drop a picture it do not work either. Gravatar said: 'quote' The site you are using needs to support service for loading images. I see you have set up your profile here at WA, this is just for setting up your profile here, it has nothing to do with your gravatar. I am assuming this is sorted out now. Please do let me us know if you need a hand with anything else moving forward. At times I will have to do my WA training on my job. There are trucks going by and I have to operate the gate for them and sometimes scan them in out. I will try to always finish my sentences before I'm interrupted by a trucker, so I make sense, just so you know. Do what works, I think to a certain degree when starting out we all have to make such sacrifices. I know I surely did. You are going to do great and it is wonderful to have you as part of the family here at WA! Hello all! I am hoping to gain a full understanding of how affiliate Marketing works. I understand that one is able to support themselves quite reasonably through affiliate marketing. As a newbie, I would appreciate any insight that would help me master affiliate marketing, so I can begin making $$$$$$ in a month or so, if not earlier. I am currently working a job (just over broke) and really need to supplement my income, without the hassle of driving in long traffic lines every day. Looking forward to connecting and brainstorming for $$$. Hello I am. Alice I am so glad you are here I will follow .Do the same . Stay in touch. Thank You so much I will follow you in return and I am glad to have the chance to me you . Hello Everyone!!! Well got that done. Ugh... Had to go on LinkedIn to get all my profile information and haven't been on there for over a year and a half... had well over 60 personal messages and close to 100 new contacts to accept.. Just now finally getting started with the training. I have to admit I'm between first and second base when it comes to computers. I'm of the age where many of us struggled to move into the 21st century. When I saw I would have to insert a photo, I thought great, give me something new to me already! Followed the video and what-da-ya know.....it worked! Off to lesson two of the first 10. Love the positive attitude! Keep up the good work! Well I had this all written out but something rather strange happened and all my words disappeared. So here I go again. The video was very enjoyable. I guess I jumped the gun a little bit because I uploaded my photo yesterday, along with writing a much shorter description than yours. I need to think more about the description. I've never really had to write anything like that about myself so I'll give it more thought as to what I might be able to add to it. I am enjoying this platform very much. I am looking forward to having great success with the help of you and others. As I am 65 years old I am hoping to be able to create enough income so that my husband can retire too and to provide us enough income to have a more secure financial future. At this time we do not have enough for our retirement. I look forward to some hand holding to help me reach my goals or at least get closer than we are now. I know in your letters you have asked me to say hello and I have not done so yet so perhaps this can be my introduction to you. I only hope this is an okay place to do this. Thank you very much for this opportunity and I look forward to my successes. Great to have you here at WAPriscilla and so glad you are enjoying everything thus far! I really do look forward to working with you and I know as you immerse yourself here within the community, things are only going to get better! I too am older and need to add to my income without leaving home. I had a minor stroke and can't stay active with any thinking for more than 2-3 hours at a time. I am good with computers, but not so good with driving business. I tried uploading my common profile picture to this site, but it said something like this was disabled. I don't know what's wrong with my image. Can someone please answer me? Also, as you may have guessed, I'm a newbie, so there's a lot I need to learn in just a short amount of time. Liked video now that I have seen it after the fact. I think problem was going too fast for video to catch up to me and I gave up before it worked. I use Chrome browser with a Samsung Galaxy S4 cell. Guess it just lagged a little? Works fine now. Could be a wifi connection, the most common problem I see with lag on phones. Some of the videos are fairly large (in particular the high def versions)) which can cause some lag at times. I see you have since sorted this out. Let us know if you have any further issues moving forward, your profile looks great! I am a newbie as well! This is my first website! I have been trying to develop one for a long time but just couldn't get it right with all the scams out there! Finally I found WA! What a pleasure!! Everything is clearly explained step by step and for someone like me it just makes everything so much easier! One question, so far, how much time do I have before I have to change to a premium member?